The City of Los Angeles has made a historic commitment to invest $1.4 billion over 30 years to fix sidewalks around the city and make them accessible to everyone. 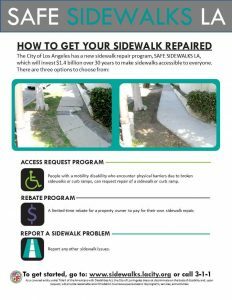 People with a mobility disability, or someone reporting on their behalf, who encounter physical barriers such as broken sidewalks, missing/broken curb ramps or other barriers in the public right of way can request sidewalk repairs through the Access Request Program. Through a cost-sharing initiative, the City is also offering a limited-time rebate program available to any property owner willing to pay for their own sidewalk repair. 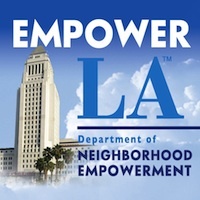 While repairs surrounding City facilities, such as fire stations, police stations, parks, libraries and recreation centers, are currently in progress, this next phase is an expansion of the repair program that will address broken sidewalks and will prioritize repair requests from people with disabilities, their families, and caretakers.